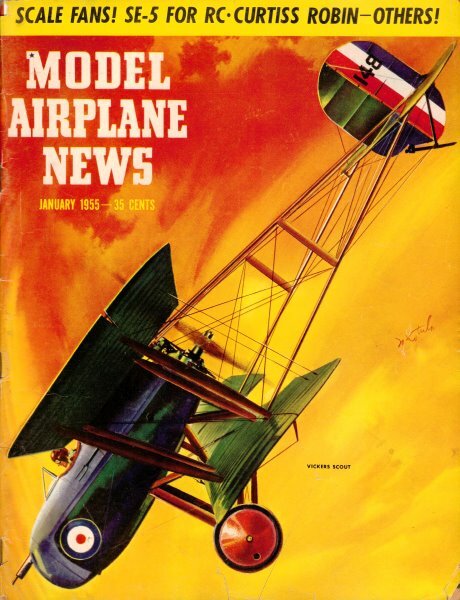 Here is a nice, lightweight WW I British SE-5 biplane for radio control. The original was rudder-only (RO) with a .15 size diesel engine for power. Designed by well-known (at the time) scale modeler Chet Lanzo, this model features break-away top and bottom wings and oversize air-filled wheels to help make hard than normal landings more survivable. A modern 3-channel setup with an electric motor should serve the SE-5 well, and would most likely yield an even lighter ready to fly weight than the original configuration. All copyrights (if any) are hereby acknowledged. You might be able to buy full-size plans from the MAN plans service. Both top and bottom wings knock off in event of a crash or, shall we say, hard landing? Excepting airwheels and stabilizer area, everything is to scale. 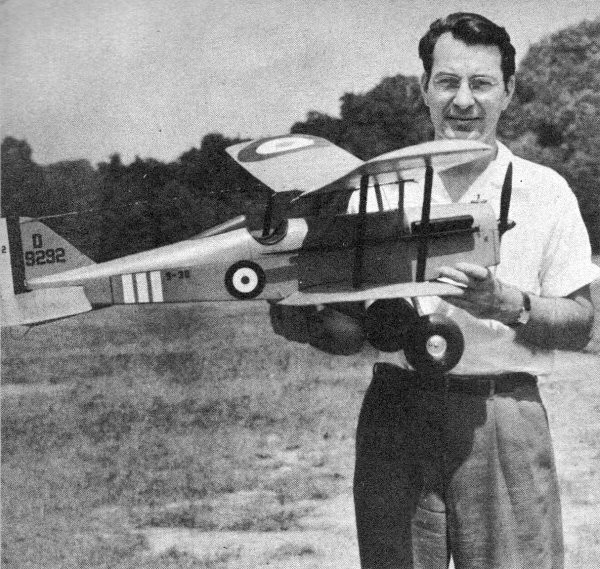 Chet Lanzo, who designed the SE-5, is one of the greatest competition fliers of modeling history and specializes in rubber and scale aircraft. Flown with notable success both as a free flight and radio controlled job, this man-sized scale model of famous SE-5 fighter is unforgettable. Flying scale models of the familiar SE-5A pursuit airplane of World War I have always shown excellent flight characteristics. Having built quite a few free flight models of this ship in the past, I felt that it would make a good radio control scale model. Subsequent radio control and free flight trials have proved it a sweet flying job. This model is true scale with but two deviations from the full size plane: larger than scale wheels are used and stab area has been increased. The air wheels have proved to be well worth the slight loss in scale appearance because of the amount of shock and beating the landing gear takes. The elevator area has been increased slightly to 20 per cent of the wing area to improve flight stability. The British SE-5 of World War I fame is one of the very few full size machines that incorporate adequate dihedral for model flying purposes. Rugged construction is very important in a radio control job and the general beefing up of this model with plywood and wire has paid off after a number of hot landings. The SE-5 has flown into trees of the thorn apple variety without any apparent damage. Adding to the crash resisting ability of the plane are the knock-off upper and lower wing panels, stab and wing struts. On a few occasions previous to the installation of the radio control gear, the model was flown free flight with very satisfactory results. The biplane configuration with the upper wing set at plus 2 to 3° and the lower wing at zero° incidence makes a very stable arrangement. The upper wing goes into a stall sooner than the lower wing at high angles of attack, and with the coupling about the CG produces a restoring moment without the usual loss in altitude accompanying a normal stall. Experience with the ED 2.46 cc Diesel shows it makes a reliable, easy-starting power plant which I recommend highly, although almost any .15 glow plug engine will produce more than adequate power for this ship. Some difficulty was experienced with the single hard tube receiver installations because of the large amount of wire used in the bird cage type of wing mount. Upon grounding of the wire to the B Minus side of the receiver, this difficulty disappeared. Warping up the trailing edges (washout) of all four of the wing tips to about 1/2 in. produces a model with improved stability in turns under power and in glide. Top and bottom wing panels are built flat over plans, dihedral being added later. Upper and lower wings are identical except the lower wing has the interplane strut hooks on the upper surface. Pin down pre-shaped leading and trailing edges, then add ribs. Next, wing tips and center section blocks. Put in 2-3/4 in. dihedral angle and spars and 1/16 dihedral braces of plywood. Sheet the center section and cover the completed panels with silk .. Stab is constructed in a manner similar to that of the wings. 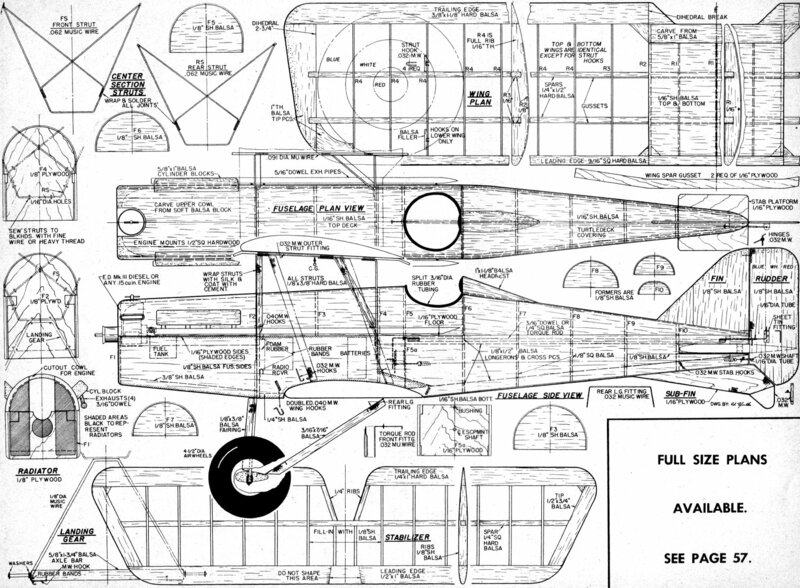 To construct fuselage, cut from 1/16 in. plywood the two side pieces that extend from the nose to former No.3. Place in position on plan. Pin down 1/8 x 1/2 in. longerons and cement in 1/8 in. sq. vertical pieces. Remove from plan and cement on 1/8 sheet curer covering. Cement body sides to former No. 1. Add nose former and fill in remaining crosspieces and formers. After assembling wire wing mount and bending landing gear to shape, secure in place with copper wire and plenty of cement. Rudder and fin are of solid 1/8 sheet. Cover formers with 1/16 sheet balsa and, upon completion, the body is covered with silk. Installation of receiver is conventional: any commercial set may be used. I built a one-tube receiver and used a standard two-position escapement. A convenient location for the switches and meter jack is the easily accessible open cockpit. Radio tuning and adjusting are done with the lower wing removed.